Highly convenient and accessible, Amara Saigon Hotel is ideally located in District 3, flanked by one of the city's major thoroughfares. Amara Hotel Saigon is 2 km from the city centre and 3 km from Ho Chi Minh City Airport, with the exhibition centre as well as the port within close proximity. Boasting 305 luxuriously appointed rooms including Suites and Executive accommodation, Amara Saigon Hotel in Vietnam meets the demands set by the business and leisure travellers. All rooms and suites are luxuriously appointed with that extra touch for the convenience and comfort of discerning guests. Those who desire an added dimension of privacy and comfort can also choose our Amara Club Floor Rooms featuring personalised butler service and exclusive Club Lounge. Excellent service combined with the innate charm and graciousness of the warm Vietnamese hospitality makes your stay a comfortable one. 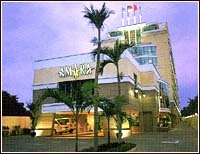 Amara Saigon Hotel provides the perfect venue for your entertainment and dining in Ho Chi Minh City. Featuring a mix of authentic international cuisines, the CafEserves Oriental and Western set specialities in Kopitiam style. Korean cuisines are also available in our specialty restaurants. To wind up the day, simply relax over a cold beer at the Party Zone Music Lounge. For arranging meetings in Ho Chi Minh City, our multi purpose ballroom with its 400 theatre-seating capacity and three function rooms can cater to various events. From weddings and social functions to meetings and exhibitions, Amara Saigon Hotel has the facilities and equipment, as well as the expertise to make all your events a success. To keep our guests relaxed and in good shape, the hotel offers an outdoor swimming pool with picturesque surrounding, fitness room and health club, which provides services such as massage, sauna, steambath and Jacuzzi. For your next hotel accommodation in Saigon, Amara Saigon Hotel provides instant room confirmation with our Saigon hotels online reservation system. At Amara Saigon Hotel in Vietnam, we have engaged the services of renowned design firms to bring you the absolute comfort & splendour of a first class business hotel in Ho Chi Minh City, Vietnam. With 305 luxuriously appointed rooms, Amara Saigon Hotel meets the demands set by the business and leisure travellers. Our rooms are tastefully furnished that will meet your desire for privacy and comfort. Comfortable and fashionable, our Superior rooms are fully equipped to meet standards in comfort and functionality for all travellers. Relax in the atmosphere of our Deluxe rooms. Spacious and lavish, they radiate an air of Vietnamese hospitality. Designed with subtle nuances of traditional Vietnamese architecture, Amara Saigon Hotel's Deluxe rooms are the synergy of work and relaxation. Come enjoy the gracious hospitality of Amara Saigon Hotel's Amara Club. Both Room and Suite are available. Featuring a personalized butler service, Amara Club members get to enjoy a host of added services like a late check-out and access to the exclusive Club Lounge. For your dining in Saigon, Amara Saigon Hotel has created a diverse menu for our guests. Come and enjoy a meal at our specialty restaurants or have a light snack at our pubs, together with our scrumptious 24-hour room service menu, you'll never go hungry at Amara Saigon Hotel. Besides international satellite TV channels, a wide selection of international periodicals and publications are also available for Club members, just so that they can keep abreast of the latest happenings in the business world. Amara Saigon Hotel is the perfect venue for hosting your next meetings in Ho Chi Minh City. Ideal for corporate meetings, seminars, wedding, product launches or private receptions, our three function rooms, each equipped with the latest audio-visual facilities, can be arranged in different configurations to suit your needs. At Amara Saigon Hotel, our hotel has all the facilities and necessary equipment to ensure the success of your events. Our highly trained staff are capable of staging the most demanding events. Our food and beverage amenities are excellent and will cater to your most discerning requests.